I fully support this project, and feel that anyone who stands in its way at this point, is a criminal and needs to be treated as a criminal. Yup, short sighted politicians at every turn. Only seeing the next election or trying to hold on to power. Destroying the Canadian energy industry the same way Diefenbaker destroyed the Canadian aerospace industry when he cancelled the Avro Arrow. The repercussions may last generations. We must build this pipeline. Will you please follow the wishes of most people and build the pipeline. Do not follow Andrew Weaver and the greens in their minority position. If this pipeline is LOST, due to Knotly Horegan and Trudeau, it might be the straw that breaks the camel’s back. Alberta, Sask, and BC, will SEPARATE FROM CANADA AND END THE stranglehold of Ottawa. Remember no pipeline no carbon tax. So…does BC accept oil coming from other countries??? Across the waters?? 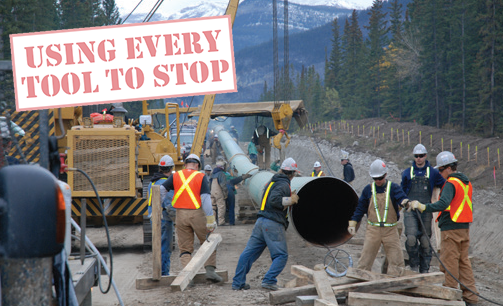 Need Federal legislation that it is illegal to restrict the installation of a project deemed in Canada’s interest and national security. Punishable by immediate arrest and up to 5 years in a Federal prison.